Let me say a couple of words about Dave Dave as another of Michael Jackson’s young friends. I know all that BS which is circulating in the Internet about him being “Michael in disguise” (a lie which is unfortunately promoted by the MJfiles blog) and don’t want anyone to buy it – it is enough to look at Dave’s disfigured hands to realize the absurdity of all those stories. “He heard about me and contacted me. He wanted to meet me. I was about 7 years old at the time (so Michael should have been 16 then). He befriended me. He took me into his life. He opened up his arms to me and accepted me as a very good friend of his. And throughout the years he never let me go. Michael was like a father to me”. He has been my friend throughout everything that I’ve been through. And he’s my only friend that I can say that’s been there for me always. He’s really had an impact on my life – not because he is a celebrity. Becuase he’s been through a kind of the same thing as I’ve been through. “He was a great person. He never hurt a soul and I’m happy to have been his friend all these years. Michael offered a lot of emotional support for me. Michael was there for me whenever I needed to talk to him. He opened up Neverland to me as a means to get away. Metaphorically he was always like a father that I never had”. It was quite an amazing experience. There was a tap on my shoulder. I turned around and there was Michael. Our relationship started with a hug. A hug that never ended throughout the years. Michael Jackson was like a father figure for me. He gave me a lot of advice, he showed me a lot of things about the world. He really was a source of emotional support for me. I believe I lost a Person in my life but at the same time I gained a lot of knowledge. As a postscript to this story I need to say one thing. The disfigured face of the burned man is quite a sight even now and one would involuntarily shy away from a picture like that. It becomes easier when you get used to it but you will probably agree with me that the initial impression is still that of a shock. Since Michael was a human being it must have been the same for him too and I’m completely awestruck by the fact that he could embrace the poor child with such genuine affection and not a quiver of pain, displeasure or any alien feeling on his face, other than love. On the other hand I can well imagine the horrifying impression such a friendship progressing into adulthood must have made on the people around Michael – let us say, the staff at Neverland, his team of assistants or even his wife, Lisa Marie Presley. In the days when people are taught day and night the goal of being beautiful and glamorous by all those fashion magazines, it must have looked like an ugly joke to Michael’s surrounding that he would choose as friends disfigured children like Dave (or bald-headed boys like Gavin Arvizo), invite them to Neverland, associate with them closely and never refuse them a call for the next 30 years or so. What I am trying to say is actually what Michael told Shmuley Boteach about his marriages (in those tapes). He said that he always gave his time to someone else and this is what very few women would put up with. Imagine that this “someone else” is always a sick somebody, a handicapped child or an old teacher of Michael suffering from complete loss of memory who doesn’t even recognize Michael when she sees him, and you will understand how big an impression of fatigue, boredom and misunderstanding this lifestyle will produce on ordinary people – like Michael’s publicity man Bob Jones, for example, or even his wife Lisa Marie Presley who is keen on sitcoms, a wild and glamorous way of life and who is ten years his younger…..
Well, Princess Diana was not the ordinary kind of woman and was well above the average and Michael did speak of her with elation as an ideal kind of a woman for himself, but having a kindred soul like that for a spouse is a very rare luck – an extremely rare luck, I would say. And if one day we discuss Lisa Marie Presley and her interview I wouldn’t want you to overlook this point. God has blessed Michael in so many ways, I am sure that he knew that. Sad, but I would bet that this beautiful story will not get any other media attention. Thank you, ‘Vindicating MJ’ group, whoever you are for spreading the good news, I wish there was something that I could do other than forward this type story to those that I know who still have some doubts. Yes, Rob and firstly God blessed him to be a real Human compassionate for other people’s woes. It was so natural for Michael to behave that way – you can feel that there was nothing forced about it at all. As soon as he heard of the child’s troubles he just called and was always there for him to talk and support him throughout his life. What is amazing is that it was both an impromtu reaction and the one which lasted for many years after that – even when Dave grew up. Many people are capable of showing compassion on the spur of the moment (and forget about it the next minute) but very few are able to carry on with it for decades after that. P.S. I’ve amended the post as I mistook Bryan Oxman’s words for those of Dave’s. If you forwarded the story to someone please correct it too. Thanks for posting this, Helena. It’s great that we have all these stories about Michael, which highlight the real him, instead of the tabloid caricature. Thank you Helena for your last two posts. I add here links to 2 videos that show one more time what a great humanitarian Michael was. Here is a story about the kid that MJ and Lisa Marie saved by paying for his liver transplant! One of my mother’s close friends is staying with us at the minute, as she’s not well with her nerves. And the woman cannot sleep at all. Now I’ve just walked into the spare bedroom and saw my mother lying next to her in bed, both clothed of course. Now when talking to my mother just now I asked about it. And she told me that her friend likes somebody to comfort her when she can’t sleep, and she doesn’t like being by herself. My mother even said she likes to get close, almost spooning. And I immediately said to my mother she’s like Michael that way, which she agreed on. Other things too. In the friends bedroom, she has 2 mannequins in there, which she said makes her feel like she has company in the room. And she says her prayers and says God bless more times than I’ve heard in my life. She had a rough childhood herself, and obviously sook comfort in God. The similarities are remarkable to say the least there. But I thought I would write it just to show that things like this didn’t just apply to Michael in life. Other people do it too. If my mother who’s a friend to this woman was to be a comfort for her, then children, who were trusted friends, like family, were no different for Michael in regards. Yes, Rodrigo, you only need to try and understand people in order to realize that similar situations can arise in everyone’s life. I also remember an older relative of ours staying at our place when I was a girl, and she could not sleep. In contrast to her I could, but she kept talking to me the whole night and I remember answering her through my sleep hoping each time that this would be her last question. We didn’t sleep in one bed but we were in the same room, as it was on most occasions with Michael too. He could not sleep and needed some companions. His mannequins by the way look so terribly like real people that I would shudder if I suddenly found one behind my back. It would not be surprise me if Michael talked to his mannequins. I even begin to realize why Michael could not sleep. He had so much energy going through him, especially after the show, that it was impossible to calm down. When haters trash me on every corner now I also feel so fierce a flame burning within me that I cannot fall asleep. Now I could make a good company for Michael, lol – we could talk the whole night through. If Michael was indeed anything like my mother’s friend, then pity and sympathy is all we should feel for him. It’s hard not too. My mother’s friend hasn’t slept in days, now to the point where she has hallucinations. Michael was must have been like that, with so much hurt and stress in his life. Your mind cannot wind down and shut off, that’s what killed the actor, Heath Ledger. An over active mind. And people like that often don’t like to be alone, especially that bad with their nerves. And how lonely must people feel to have mannequins in their bedrooms? I was watching that old show, Jacksons, American Dream yesterday, which portrayed things as close as they were in real life. Even down to Michael being a nervous flyer, when he was a kid even. You look at him with all these animals in the Encino home. He treat them as good as his own children, especially Bubbles. 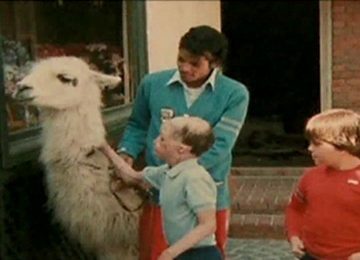 How often must Michael have lay in bed unable to sleep, occupying himself with his animals, just to keep himself sane? Unable to sleep and constantly thinking about the things that bothered him? Having the mannequins must have made him feel he wasn’t alone. He told the Rabbi he didn’t talk to them, but I think he just said that so he didn’t make himself sound certifiable crazy. Being that lonely, and unable to confide in anyone, he must have talked to the mannequins. It’s like a diary or even people talking into webcams. I see Michael doing that…Then he began calling people up at all times because he was THAT lonely and THAT unable to sleep. He needed the company, just like my mother’s friend. It’s a sad thing to see, which I have now. Those who haven’t just can’t understand, and not many people have…so they’ll remain ignorant. Like Evan Chandler was til his dying day. Like the media and the haters on Topix. One of them says a parent brung their child to Michael’s bedroom one night. Well, we know why. Michael needed companionship and comfort in his lonely and sleepless nights. It’s a horrible thing. My case is not that bad yet, but my nerves are on edge and all feelings have become stronger. This is what kills me most – the fact that no one wants to understand. I begin to suspect that Michael’s haters are not human at all. Their hearts seem to be made of stone or ice, with no compassion, no empathy, no human feelings. These people are fearful, they are capable of anything. Hopefully God will teach them a lesson and they will reap the fruit of their deeds. I’m sure it’s tough for you, Helena. But remain strong. I was reading more of their comments a few days ago…at first it used to bother me. But now I think, who are those people? What do they matter? Honestly, they’re not worth spitting on. Re Michael´s insomnia, a few points; It is advised that people with insomnia and people generally not do strenuous exercises some hrs before bedtime.Michael did do exactly that performing at night. Also he frequently changed timezones. These tend to break up the normal diurnal rythm.And there are indications that he had some separation anxiety that bothered him esp. at night. True, they are the scum of the earth. But they go on implanting lies in people’s minds and are revising history about MJ. They also killed this innocent man and are killing the truth now. We can make them prevail or we can stop them. And can I choose not to be strong? I simply have to. Haters are trashing me for the third day running on Youtube. Sometimes I feel like I am all alone in this world. You’re not alone, Helena. We’re all here by your side, and there’s countless others out there who are fighting the same fight. You just get some of the small minded idiots out there who have nothing better to do than spew poison, we’ve all had it. I used to get frustrated by it all, but I just looked at them and everything else from a different perspective. I’m no longer angry at them. Rather, I either laugh or pity them, and I let them know it. Yes, we all had and still have it. But I am speaking up for Michael and cannot let them get away with their lies. Though of course they are laughable. The case I currently have on Youtube is a clinical one. But if you come to think of it, tabloids lying about MJ are clinically ill too. Even some mainstream journalists are. No serious discussion of anything connected with Michael. The same old lies which were told and retold a thousand times. Disgusting and boring. And their dark agenda is seen so clearly. I learned long ago, never wrestle with a pig, you get dirty; and besides, the pig likes it. This quote fits it perfectly, dear vmj, don´t waste your precious time with those pigs !!! Apph, I understand and thank you for the great quote. But I am wrestling and getting dirty all over because I want the word of truth about Michael to be spread. There is always a small chance that someone else will read the truth about MJ and will change his opinion. Or that at least a doubt will enter their minds and this will start the process of thinking. In short I am doing it not for the pigs, I am doing it for the onlookers.